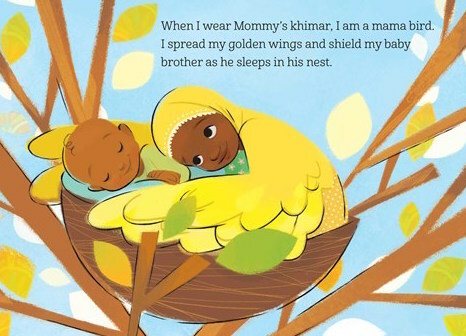 Mommy's Khimar is a delightful new picture book that is full of love, sunshine and imagination. A young Muslim girl plays dress up with her mother's khimar, or Islamic headscarf. When she wraps it around herself, she feels her mother's love surrounding her and she imagines all of the things she can be. The bright, warm illustrations convey all of this love and draw young readers to this story. 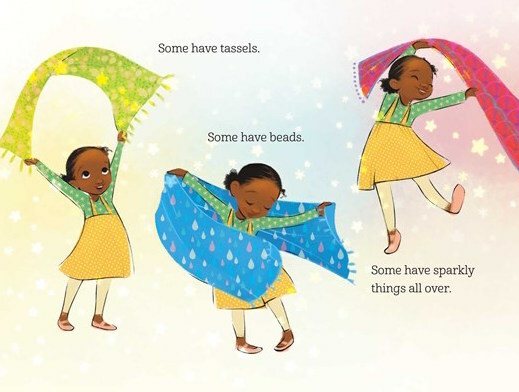 I especially appreciate how this picture book is both specific to this young girl's African American Muslim culture and universal. Many of my students will recognize themselves in this story. Some wear a headscarf every day and will see their family's love and heritage in this story. Others will recognize the joy in playing with their mother's clothes. I am honored to have Jamilah Thompkins-Bigelow as my guest here today. My questions are in red below, followed by her answers. 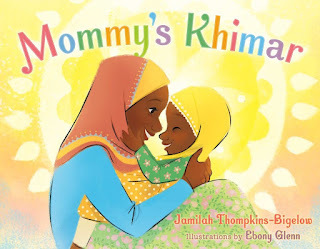 What planted the seeds for writing Mommy's Khimar? Wearing a khimar or an Islamic headscarf is part of my everyday life but I wasn’t really sure that I wanted to focus on that in writing kidlit with Muslim characters. I remember thinking people always make this piece of cloth so serious but as a kid I didn’t really see it that way. Khimars were soft, silky scarves I borrowed from my mother when it was time to pray or wrapped around myself to create pretend dresses and gowns. So, I guess I ended up telling a story about how four-year-old me saw the khimar. "A khimar is a flowing scarf that my mommy wears." What ran through your head the first time you saw the delightful illustrations by Ebony Glenn? I was just so giddy! I loved the main character’s facial expressions. She’s very adorable. The scene when she is playing in the closet with all of the khimars is magical every time I look at it. And--this may sound strange--but I loved that the characters have dark skin. In the rare stories about Muslims, I rarely if ever see Black Muslims depicted. It was nice to have more diversity. "Some have tassels. Some have beads. Some have sparkly things all over." I'd love to learn more about why you wear a khimar. Can you tell me a little about this tradition and what it means to you? I was 14 years old when I decided to wear full hijab. Full hijab is the khimar/head covering and clothing that covers everything except the face and hands. I started exploring my faith more around that time and I saw this as a way to demonstrate my faith in God. I also liked and continue to like the way it identifies me as Muslim. 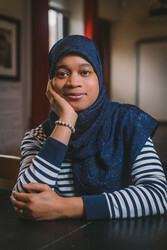 Although I am a religious minority, I get to feel connected to other Muslims who are also identifiably Muslim--even strangers on the street. This wasn’t actually a tradition of my family though. My father is a convert to Islam and although my mother grew up in a Muslim culture, she didn’t regularly wear a khimar when I was growing up unless she was going to the mosque. "When I wear Mommy's khimar, I am a mama bird. brother as he sleeps in his nest." I'm curious about your family heritage. I love the diverse families included in your story. Can you tell us a little about your family? I see you're a program director for Mighty Writers--I love the sound of this! Can you tell us a little about your work there? The mission of Mighty Writers is to teach kids to think and write with clarity. We are a Philadelphia-based nonprofit that provides writing instruction in after school, evening, weekend, summer, and mentorship programs to youth ages 2 to 18 and we provide all of that instruction for free. My work is to create writing programs, teach writing programs, and engage volunteers in doing that work too. What are some other favorite picture books you like to read with your students at Mighty Writers? There are so many! In recent months, I have enjoyed reading It’s Okay to be Different by Todd Parr, The Name Jar by Yangsook Choi, and Last Stop on Market Street by Matt de la Pena. I think the kids and I have had the most fun reading Say Hello! by Rachel Isadora. Thank you so much, Jamilah. Your book has already brought my students and me so much happiness. Much luck to your continued writing. Illustrations copyright ©2017 Ebony Glenn, shared by permission of the publisher. The review copy was kindly sent by the publisher, Simon Schuster. If you make a purchase using the Amazon links on this site, a small portion goes to Great Kid Books. Thank you for your support. I loved reading this interview. Thanks!